In honor of National Pollinator Week (June 17-23), a discussion of pollinators, pests, and how we deal with them seems in order. 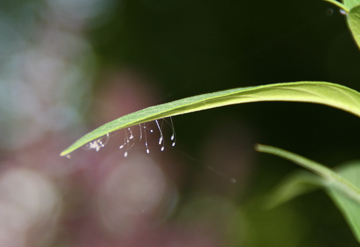 As gardeners, we are aware of the insect life that surrounds our favorite plants and flowers. We anticipate the fruits of our labor a when we plant our first seedlings after frost danger has passed in spring, or sow seed for the following year before winter arrives. One of the most important things to notice about the insects present in our world is that a majority of them are not pests; they are integral parts of the garden ecosystems we create, and the natural landscapes we cherish and steward. Pollination by insects (and animals) is definitely important to increase our favorite blooms, and create seeds for us to restart our favorite plants. However, did you know that approximately two-thirds of the world’s crops rely on bees and other pollinators to pollinate them? [Beyers] Are you aware of the declining populations of pollinators (bees in particular), and the things we can do as homeowners to protect them? This has a negative effect on food supply in conjunction with the economy. The economic value of honeybee pollination services in the United States is estimated at $14.6 billion annually. For native bees, California has estimated that wild bee species add $2.4 billion per year to California’s agriculture alone. [Congressional Research Service]. So, in addition to food products and ecosystems at stake, there is a monetary aspect attached to this issue. So, you are not a beekeeper. Or a California almond farmer. Or a USDA economist. What does all of this mean to you, and how on Earth can you be of help? As a gardener, from window boxes to hundreds of acres, you are involved. 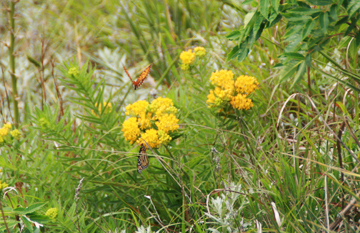 Your choice of plants, how you arrange them, and how you treat them are all factors that directly affect pollinators. First, you can create habitat. 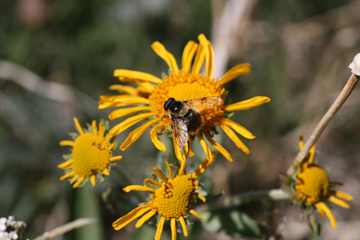 Some weeds are not noxious, and are good nectar sources for pollinators. If they are unwanted, try planting native forbs as a source. They can suppress those weeds, and attract beneficial insects as well. Also, mulching new plantings can help keep weeds at bay. These practices can reduce the need for herbicides and insecticides [USDA AF Notes-35]. There are many plants in addition to natives that are wonderful nectar sources for bees and beneficial insects, as well. Also, how you plant them can affect the ability of foraging insects; for example, planting species in clumps allows for more efficient foraging. Biological: releasing beneficial insects, such as predatory and parasitoid wasps Aphidius and Aphidoletes, or green lacewings Chrysoperla spp. When practicing IPM, using chemicals is always the last resort. Many times, the high powered water is completely sufficient! If you do have to apply a chemical, one of the most important things you can do to protect pollinators is to become educated on pesticides. Many of the chemicals available to homeowners are currently not required to warn of bee toxicity that may occur over time, or other adverse effects of the product. They have simple names like ‘Bayer Tree and Shrub Protect,’ which gives the user no indication of what that chemical actually does, to what insect, and what other effects it might have on the natural environment. Taking the time to learn about the chemical, its formulation, how to apply the appropriate amount and apply it correctly are worth it for pollinators, as well as your family and public health. Also, learn your pest! Broad spectrum insecticides are usually just that; they can be harmful to the good guys as well as the bad. So, next time you bite into a juicy apple, or when you excitedly harvest your first summer squash this season, think about the pollinators. Think about all they do for us, and then contemplate the simple things we can do to give them a little back.